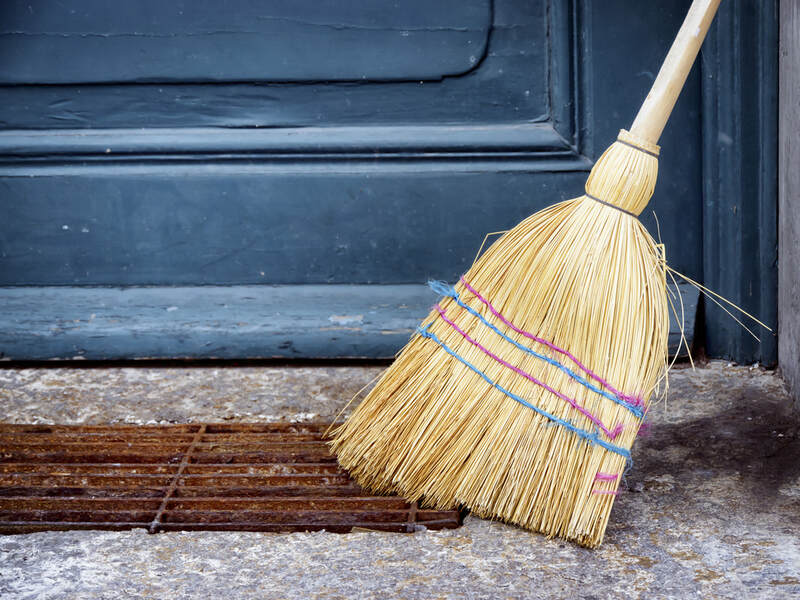 A broom is not simply an instrument for cleaning surfaces, but an integrated component of a sweeper’s personality, a sweeper’s purpose, the way in which a sweeper is presented to the world. At least it was for me. It was early in the afternoon, so early we were barely open, when I saw Radomila for the first time. Her blonde curls bounced carelessly off the shoulders of her overcoat. Though beautiful, she appeared to be living elsewhere, even then. Perhaps one should say even still, on account of that to which she had been subjected. She walked across the floor and down the hall and into the rooms in back. Aron and Josef as they had done for others would come to her aid with a means to survive, and more importantly with an enlightened community of the like-minded. She would live in the building adjacent to mine, in an apartment on the third floor. When her light was on in the evening it would be visible to me across a narrow alley. This would make it easier for me to do as I was expected to do. She would be aware that I was living near her. Anything beyond it she likely would attribute to coincidence. I expected she would spend most of her time in a relatively small geographic slice of the city, like the rest of us did, the nooks and crannies of Krakow where the bulk of our living was done. The nook of central importance to all of us was the Blue Star. It was hardly unusual for there to be a tavern in a cellar in Krakow, and so the Blue Star was inconspicuous, which was a good thing. It was in the vicinity of Market Square, meaning we were hardly hiding, and most of what one needed was never far away. Radomila’s life turned out to be as simple as mine. I would notice when she was about to leave, each night, and discreetly prepare to leave myself. Coming out of the Blue Star onto a Stolarska sidewalk deep with snow, she would trudge off in the direction of Dominikanska. At times she would turn left on Dominikanska rather than right, walk down Poselska to Grodzka, and then the short distance down to Senacka, when it was much easier simply to turn right at Dominikanska, and left on Grodzka, skipping Poselska altogether. Whether this was some strategic choice based on personal experience, mindful of a need to confuse authorities, or simply for the sake of variety I never knew, and never asked. I would watch her enter her building, often through a blur of falling snow, squinting my eyes as though peering at her through a beaded curtain. Most of us had had respectable, some even relatively elevated positions before our transgressions caused us to be dismissed, stricken from the rolls of the employable. There was a former engineer, a former economist, a former physician and former mathematician. All were relegated afterwards to simple service jobs and menial functions. But at least they could carry them out at the Blue Star. I had been a professor of world literature, teaching it to the best of my ability under the many restrictions imposed. It is difficult to tell students about something the state doesn’t permit one to tell them about, in this case much of the world’s writing, and even much of our own. I squeezed all I could of value into the delimited lessons I was able to offer, until finally, even that was far too much. It was Aron and Josef who devised my role as lowly, perhaps even imbecilic sweeper of floors, emptier of garbage cans and swabber of tables. It constituted gainful employment and provided sustenance otherwise unattainable for those cast adrift by the Polish state. But aside from keeping floors clean, an additional usefulness had been intended. The man with the broom was able to quietly, and innocuously observe. Our enemies were inclined to watch, and if they attempted to come amongst us unbeknownst to us, they could be identified from a place of hiding that was in plain sight. This was useful as well for keeping a watchful, protective eye on Radomila. The job of hostess was invented specifically for Radomila, for there had never been a hostess at the Blue Star. Less a greeter than a representative, she moved through the rooms engaging patrons, and in essence charming them. A less conspicuous role would have wasted her beauty. One of my favorite things during the course of the evening was to step outside for air, and to stand in the snow on Stolarska smoking a cigarette and watching cars pass. I would pretend when I returned inside again to see it all anew, the cavernous walls made of brick and stone, the paintings and photographs, the backlit bottles of booze colorfully gleaming on their shelves, the stone arches and the sweeping murals, even the pamphlets plastered to every conceivable surface. One night after closing some of us lingered well into the night drinking. By the time I left I was ridiculously drunk, though mindful still of the need to follow Radomila. Brygida was going back to my apartment with me. It was next to impossible for us to be discreet, Brygida and I falling down in the snow numerous times and cackling. So the two of us waved at Radomila and called her name. Radomila waved back. No doubt Radomila saw us stumbling into lampposts, or bouncing off the sides of buildings, sliding on our pants on the patches of ice. At one point Brygida began to loudly curse a man who had allowed his dog to relieve himself of a stupendous pile of turds in the new immaculate snow. The man cursed her back and continued to walk his dog. My apartment was tiny. It had a small stove, a bed, a radio, a record player and a stack of albums. There was a poster of Malcolm X on the wall, and on the windowsill a photograph of Proust. Brygida and I rolled around in the entrance, knocking the coats off the rack, and banging around some of the pots and pans before we finally made it onto the bed. Later, I was awake listening to the water roiling through the radiators bringing us welcome warmth. Next to the bed I could see Brygida’s black turtleneck on the floor, and her black jeans, and her black boots, her long strands of brown hair splayed across my shoulder. I found myself staring at the frozen flowers, the ice crystals that had begun to sparkle in the earliest morning light. At the same time I was thinking of Radomila. The authorities retained a keener interest in Radomila than they did in the rest of us. She had been in the shipyards in Gdansk during the strikes, among those who had distributed The Coastal Worker before the strikes began. After the outlawing of Solidarity she had been an integral part up of the effort to establish publishing hideaways, and smuggling networks that funneled samizdat. She was especially adept at obtaining printing equipment, in particular siphoning it out of the official publishing houses. I couldn’t follow her everywhere of course, nor did I try, and I wasn’t expected to. The important thing was to discover as quickly as possible if the authorities had begun to follow her. They often swept you up in the dead of night, so no one could know precisely what had happened to you. I would follow her as often as I could when she left the building, anytime I noticed that she was leaving. Doing this caused me to feel much like an agent myself. The goal was to protect her, not to restrict her freedom. Yet it could not be denied her privacy was being violated. While reading one afternoon, and looking out the window I noticed Radomila leaving her building. I scrambled to dress, then walked in a hurry along Senacka until I saw her just as she was turning into Grodzka. She walked at a steady clip, neither dawdling nor window-shopping. It was obvious rather quickly there was no surveillance. But since I already had gone to the trouble of leaving my warm and cozy apartment I decided to follow her anyhow. In the end Radomila was merely traipsing about in Market Square, unremarkable for some, yet not so for one locked away for a considerable period of time. She gazed up at St. Mary’s for the longest time. The Christmas candy stand was up, bright candy canes, lollipops, gingerbread and chocolate hearts, and she remained in front of it seemingly ensorcelled. She craned her neck looking at the Town Hall spire, as if she wished to implant it in her memory for good. That evening I resumed my public identity among the broom trays and the disinfectants. I swept thoroughly, made my way from one end of the tavern to the other emptying all of the ashtrays, wiping the tables down with a damp cloth. I got inside the bathrooms with my bucket and mop, brightening them as much as humanly feasible. When the work was finished I waited as I customarily did for Radomila to depart ahead of me. It was snowing huge wet fluffy flakes when I came up the steps to Stolarska, and I could barely discern the figure of Radomila walking a short distance in front of me. Had it not been for the bright red coat I mightn’t have noticed when she diverged from her normal route. It didn’t take long for me to realize that she was detouring through Krakow’s finest park, The Planty, which she could pass through, and exit on the other side headed in the direction of her apartment. The beauty of The Planty in winter was irresistible. Evergreens sagged under the weighty bracelets of snow that girdled them, and the globes of the lamps along the promenade formed a greeting line of glowing alien heads in the swirling snow. The next day the Blue Star’s little cadre of employees gathered in the office as we did every so often for something vaguely resembling a meeting. Josef and Aron’s desks were there, and the room accommodated numerous chairs, filing cabinets, typewriters, stacks of books, papers and tapes, along with heaping ashtrays and empty bottles of beer. The general purpose was to engage in a ragged wrangling of decision-making, weighing which books, papers, and magazines a consensus of us concluded ought to be reproduced and disseminated from the Blue Star’s own small samizdat shop. “What a strange argument,” she replied. Before that I had had no more than a few direct interactions with Radomila. My multi-purpose sweeping job carried a certain requirement of reticence, a public persona of dullness, even muteness. I arrived at work before Radomila each day and spoke to her only in passing, exchanging basic civilities, or briefly discussing practical matters that arose at the tavern. Like the others, I had only recently met her, so an exchange of deep confidences wasn’t in the cards soon. Indeed, becoming friends would have been a complication, even if a rewarding one. For instance, knowing that I lived near her, what if she were to propose our walking home together after work? My ability to observe her, and therefore observe others who were observing her then would be compromised. That night, the band UR-100 performed. They had named themselves after a Soviet nuclear ballistic missile. Lacking permission to play in official venues they played in unofficial ones such as the Blue Star. They sawed at their electric guitars, pounded their drums primitively, and sang in primordial wails. The men were hairy and clad in Cossack fur. The blonde hair of the single female in the band swayed in the vicinity of her navel. Remarkably all of it was rather compelling. When I got home I put on an ambient Brian Eno album and settled into the bed to read. I got up to turn the lights out later, standing in the dark looking out the window one last time before I went to sleep. Radomila’s light was on. It was a night a little after Christmas, and I’d spent an inordinate amount of time after closing searching the utility closet for one of my favorite scrubbing tools. I found it lying on the floor wedged behind a crate of sponges and a wet mop. Radomila had carted several things to Lost and Found, a scarf, a set of keys and a tiny plastic replica of the Eiffel Tower. She chatted briefly with Iwo, who tended bar, then bundled up in her garments and left. It had snowed heavily throughout the afternoon, but in the evening the snow had turned to rain. It coated everything in silvery buffers of ice, and put a glaze atop the fresh snow. Radomila was ahead of me in the street as she always was. Even had the streets not been deserted I could have spotted the man trailing behind her. He followed, as I customarily did, on the opposite side of the street. He wore a heavy dark parka and a black cap, earflaps pulled down to cover his ears. He remained a considerable distance behind her, farther than I normally did. You could walk on top of the icy snow, but if your foot happened to break the surface it made a loud crack. When he approached her building, I ducked inside an entranceway, poking out my head when I wanted to look. Radomila had gone inside, but the man continued, at the end of the block crossing the street, then stopping directly across from her building. He lingered there until her light went on, and having identified the apartment she was in headed back in the direction of the Blue Star. I followed him all the way to Stolarska. He walked past the Blue Star, and a little beyond it got into a brown car. I waited until he had driven away, before I turned back around and walked home. I must have looked out the window forty or fifty times for the remainder of the night, and then the following day until it was time for work. I needed to get to the tavern well before Radomila did. There was no one lurking in the vicinity of her building as I departed. I reported what I had seen the night before to Aron and Josef. We sat in the office discussing it. Did the authorities simply wish to amend her file, adding her present whereabouts? Was it more sinister? The best course of action, it was decided, was to wait and see. Knowing they were hanging around, we could be alert to the need to quickly preempt a detention should we get the chance. That had been the purpose of my keeping an eye on her all along. That evening was a Blue Star specialty, Storyteller Night, the stage given over to the yarn spinners who spun their own, or recited those of others. It was around ten, when I recognized, as most in the room did, the arrival of the men in the drab beige and blue nylon jackets, large black Yugoslavian shoes, and grey hats rimmed with brown fur. Agents were not imaginative, and never particularly cared if they were recognized. Power over others made them blasé. After I informed Aron and Josef, Aron picked up the telephone. Later, Radomila was notified. It was a perverse honor, but some they feared and distrusted so thoroughly they would never let them be. There was no “paying your debt” with a prison sentence. “Visits,” muggings and detentions became your lot in life. And now we knew. Such would be the case for Radomila. And she had made the choice to escape it. Fight them from beyond. So be it. At closing time the agents paid their bill, then lumbered out the door among a bulge of others. One of the regulars who had left previously returned to let us know the agents were standing in the front waiting. It was decided Radomila would spend the night. Aron and Josef already had made the arrangements for her to flee to Budapest where friends would be awaiting her. From there she would go to Austria. Then we hoped, all the way to London. I was told to leave just as I always did. I took Radomila by the hand and wished her well. Outside on Stolarska one of the agents stood against the car, another sitting behind the wheel warming himself. The following afternoon I learned that the agents hadn’t lasted long. No one knew if they had planned a return, getting hot soup in the meantime, perhaps. Shortly after their departure Radomila had been spirited off. After six or seven weeks had passed, the agents had not returned, and we still had heard nothing of Radomila’s whereabouts. As for me, I returned to my previous pattern, ably performing with my stalwart broom, and subtly keeping watch. I left after work whenever I chose now, and walked home any route I wished. But once I was there, safe and warm in the apartment I never lost the habit of looking out the window for Radomila's light.